Steve attended Indiana University School of Music and studied with Bernie Adelstein, legendary American orchestral trumpet player. He came to New York City in 1996 and quickly connected with Broadway Show tours in the US and Europe. 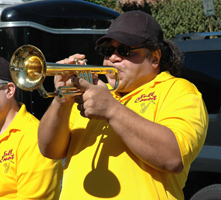 In addition to working in Broadway shows Steve has extensive experience playing Big Band Jazz for the Lincoln Center Latin Jazz Orchestra, Duke Ellington Orchestra, Chico O’Farill Afro Cuban Orchestra, Cab Calloway, Glenn Miller and Tommy Dorsey Orchestras to name a few. He has played in countless Rhythm & Blues horn sections, worked with the Four Tops, the Temptations, the O’Jays and Aretha Franklin.